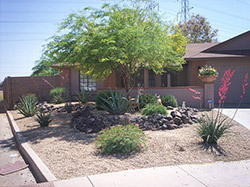 At Advant-Edge Decorative Curbing & Landscaping, we are considered the landscaping authority in Arizona. Our team of landscapers and designers has created stunning landscapes for residential and commercial property owners in Phoenix, Peoria, and Scottsdale. We have maintained hundreds of properties, created stunning landscape designs, and installed some of the most amazing outdoor amenities for our valued clients. As a one-stop shop, you can hire us to work on all possible landscape improvement, maintenance, and installation projects. Design – The blueprint of all great landscapes is the design plan, and when it comes to creating the best landscape designs, no other Arizona company outdoes us at Advant-Edge. Our designers use cutting-edge computer software to create detailed, vivid design studies for our clients. We employ the right design principles and techniques and incorporate our clients’ specifications to achieve the perfect design plan. Installation – We can install all your desired landscape features and outdoor amenities using your desired materials and following the approved design plan. Be it a patio, pool, outdoor kitchen, deck, or retaining wall, you can expect exquisite workmanship from us. The plantings that we use are all handpicked from our nursery, so you are assured of their quality. Maintenance – We can offer you the best maintenance package so your lawn remains in great shape and condition all-year long. Whether you need help with mowing and trimming, or you want us to perform seasonal cleanups, we guarantee to do the jobs right the first time. We have packages for drought-resistant landscapes that seek to take care of our clients’ need for an eco-friendly landscape. Starting at over $2,000, you can already enjoy professionally handled landscaping tasks that will make use of xeriscaping and other techniques to achieve low maintenance and drought-resistant landscapes. We can install automated drip irrigation systems, ground cover, boulders, and other features for a truly authentic Arizona lawn setup. We only install plants that require minimal upkeep and watering requirements so you won’t worry about periodic maintenance or high water bills. If you are living in a drought prone area of Arizona and still want to have that green looking lawn on your property then why not consider fake grass? One of the biggest benefits of applying artificial turf to your property is that you will have that green grass look but without all the maintenance and up-keep. It will never need to be mowed or watered; making it the ideal ground cover for our regions climate. There will be no weeding, fertilizing, trimming, edging and when installed professionally your fake grass will look like natural grass! We are particularly proud of our nursery, where we have all types of plantings – turf, annuals, perennials, shrubs, ground cover, ornamental trees, and the like. All of these are properly grown in our nursery, courtesy of our plant experts/horticulturists. Having our own nursery means that we can install any type or volume of plants that you need, so no problem if you have a large landscaping project. We only use quality landscaping materials and supplies straight from our partners – from mulches and fertilizers to pavers and sprinklers. We can source your desired materials with ease since we have existing contacts with trusted suppliers and manufacturers of landscaping-related products. If you demand excellence the same way that we do, then you’d be happy to know that all our past clients in Phoenix and nearby AZ locations were all highly satisfied with the quality of our work. We are licensed and bonded, so you’re certain that you’re dealing with professionals who know their craft well. 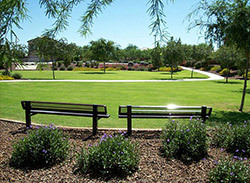 Dial (623) 398-6319 now, and let us address all your landscaping concerns.